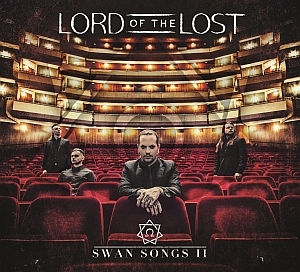 Lord of the Lost traded in their industrial sound for a symphonic one in Swan Songs II via Napalm Records. The German rockers return with this follow up to their 2015 album Swan Songs with a bigger sense of adventure and wonder. Lord of the Lost creates the perfect ode for all the anti heroes/heroines out there titled “The Broken Ones” and has a dramatic and cinematic intro that will grab your attention. You will feel sympathy for the devil after listening to the “The Devil You Know” which continues to play with the theme of being misunderstood, aren’t we all!? “Ribcages” and “My Better Me” are not only a beautiful, hopeful and anguished songs that will hit your soft spot. “Wander In Sable” will serve as a great musical number when you are about to embark on an adventure of your lifetime to the taco shop. Though this album is not my cup of wine, this album is enjoyable, and serves as a great soundtrack to compliment your rainy days and your fan fic writing. Grab your best fancy shmancy suit and get your copy here. 3 out 6, Away we go! The Black Dahlia Murder will slash and smash ya with their latest Nightbringers via Metal Blade Records. TBDM begin this new hellish ride with the ominous “Widowmaker,” which is just as brutal as any GoT episode, I KNOW YOU WATCH IT! So don’t even try to deny it! They stay on a roll in this bloody vengeance and though they slightly slow their pace down for the title track, it allows the nice little breakdown from Brandon Ellis to really simmer. “Kings of the Nightworld” deserves to be the meaty center of this album not just ‘cause it has an awesome title but also because it’s an awesome and brutal song. Ellis takes the lead in that catchy intro before emptying itself out in to more death metal goodness. If you’re still not convinced, you gotta stick to the end and listen to the last track “The Lonely Deceased” which the J-Oh’ster is very certain is a tragic ode about her. Travis Strnad is more relentless than ever and the rest of The Black Dahlia Murder is here to back him up fully. If you’re a TBDM lover, this is definitely for you as they still maintain their signature melodic death metal sound. Get your copy here and see how you feel about this latest travesty! 6 Out of 6, They are the night! We fall into the void with Wheelfall as they crack open their latest album The Atrocity Reports via Apathia Records. The French industrial band solidifies their enigmatical presence with “The Way to Every Crime is Ours” and “Violence Is Seduction.” These tracks are perfect for your next escape mission. The calculated tempo from drummer Niko Giruad builds quite the anticipation and Fabien Furter’s vocals will put you on edge before those badass riffs lunge at you with the heightened instrumentals. “Compulsions” lives up to its name and you will feel its faint volatility bubble beneath that thin veil of self control. The struggle is real man! Another song that will get your blood pumping is “Impenitent,” a track where Wheelfall let us have it! Giruad takes the lead in “There Is No You” piques your interest and makes you wonder what’s gonna happen next?! Right before you get catapulted in to the distorted wormhole known as “Control” and “Black Bile” where Furter greets you with clean and pained vocals. The final song “Lost Cause” has Furter lay some of his deep vocals giving a hint of death rock elements to this song. Furter’s anguish and anger will continue to strike you down. The Atrocity Files is the Lynchian side of The X-Files and is a case worth taking. Check out their stuff and get your copy here. 6 out 6, Sign me up, Scotty! Bust out your drinking horns and gather around the fire! ‘Cause we’re about to have a good time with Viking metallers Baldrs Draumar and their third independent LP . These warriors are determined to show you a great time with their jolly first track “Hymirs tsjettel” aren’t you glad I asked you to bust out your drinking horn in the beginning? Viking life wasn’t all about pillaging and conquering, and sometimes they just wanna express themselves after a long day. Baldrs Draumar show their softer side in “Hadagrims ferttriet” before picking things up with “Deät Lun,” “Tsjoch op” which have a catchy chorus. That’s right, you will be singing along to these even if you don’t speak any Frisian. Baldrs Draumar’s latest is a hell of a lot more tame and teaming with feelings, the opposite of their previous release Aldgillissoan. Fan Fryslans Ferline serves as a sweet homecoming after a long battle. Baldrs Draumar just wanna sit next to you by the fire and sing beautiful songs in their native tongue. There is a lot wonderful instrumental pieces from Baldrs Draumar and will leave you satisfied even if wasn’t quite what you were expecting. Check out their album here and once you’re wooed get the album here.